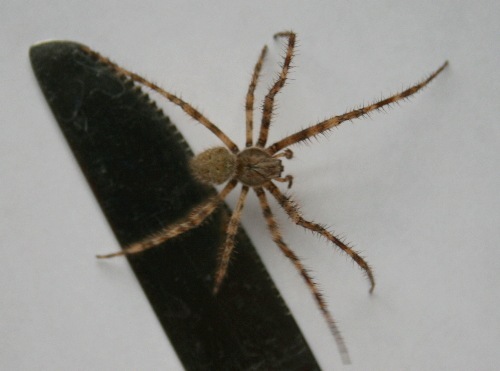 Late last week we received a visit from this spider, which Dan discovered on the silverware in the drying rack while he was washing dishes. I gather it appeared out of nowhere and caught Dan quite by surprise, not least of all because of its size. Though it’s mostly all leg, it’s still impressively large. He carefully saved it in the fridge for me, and I did my best to push aside my squeamishness over spiders (one of the few groups of invertebrates I get that way around) to take a few photos. I moved him out to our woodshed once I was done, where I felt his presence was more appropriate. The spider is male, which I could immediately tell by the two short, round projections at its front; these are its pedipalps, which are modified mouthparts the male spiders use to transfer sperm packets from their own abdomen to the female spider during mating, so females don’t have them. Considering that female spiders are most often noticeably larger the males, it left me wondering just how big the females of this species must be. I didn’t know the species right away, despite the size of this guy, and so spent a while flipping through pages on BugGuide. For all that I can ID our local birds with a glance or quickly guess the families, if not the species, of most of the moths and butterflies and dragonflies I encounter, when it comes to spiders and some other groups of insects I’m back to being a novice again. My identification method usually becomes scanning the photos associated with each family, looking for something that might be similar. Usually I end up checking out half a dozen families, sometimes more, looking for a photo of an individual that seems to match mine. Most of the time I can reach an ID, though it can be time-consuming. Despite what would seem to be a very distinctive individual, given the size and those bristly legs and the interesting rayed-circle pattern on the thorax, I didn’t come up with a conclusive identification for this guy; but I’m leaning toward Cross Orbweaver, Araneus diadematus. Normally I think of the orbweavers as having huge, spherical abdomens, so the family didn’t immediately cross my mind for this one. But it’s the females that look like that; the males are slimmer. What prompted me to check that family for photos was the short third pair of legs. I’ve come to think of this as a defining feature of the orbweaver family, but I can’t see anything to say that’s true. Defining or not, it is still a feature, however; those shorter third legs are modified for use in building the stereotypical spiderwebs the group is known for. The Cross Orbweavers are a very big species; BugGuide gives the average measurement as 13mm (1/2″), and that’s just the body. Once you add legs to that, you’ve got an impressively large spider. Check out this male and female of the species, above, then compare to my top image with average-sized butterknife. As I checked out the page for the species, I recalled some massive female orbweavers that hung around the covered walkway along the back of our house, where I set out my moth trap. I unfortunately seem not to have taken any photos of them, so I can’t be sure they were the same species. The records on BugGuide are nearly all late summer and fall, right into November for Ontario. It’s only found in northeastern and western North America; like so many of our species, it’s a European introduction. 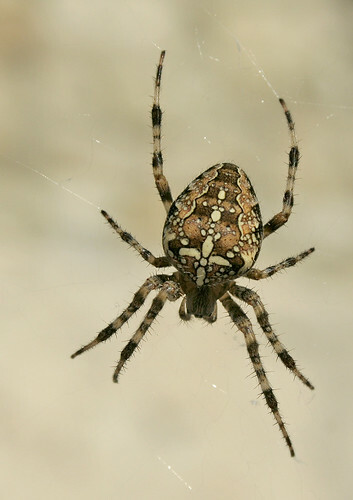 It goes by the name European Garden Spider in its native range and is, unsurprisingly, a common resident of gardens. I gather orbweavers are very docile spiders, slow to bite, and with a preference for flight rather than fight. I did in fact have some trouble getting this one to sit still for me, but I had no inclination to put out my hand to stop him. It’s not that I fear being bitten – the bite is supposedly no more painful than a bee sting – as much as it is just the creep factor of having a spider walking over me. If this was a moth, however, or a beetle or praying mantis or walking stick, no problem. But just can’t do with with a spider. One last interesting fact: orbweavers are mostly nocturnal. 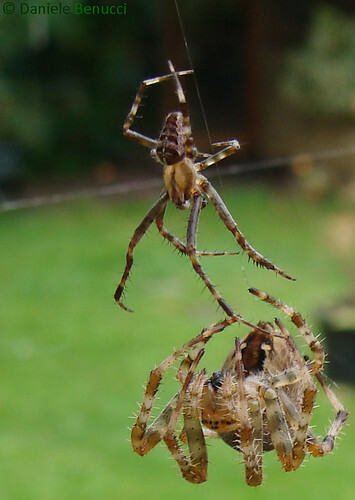 During the day they’ll either hang out on their web, or in a bit of cover such as a rolled-up leaf nearby, only coming out to immobilize trapped prey. At night they return to their web, rebuilding any damaged sections. A few species actually ingest the remains of the old web and build an entirely new one from scratch. I recall watching one of the large females actively building a web one evening while I was checking my moth sheet, though whether she was repairing or building fresh I couldn’t say. 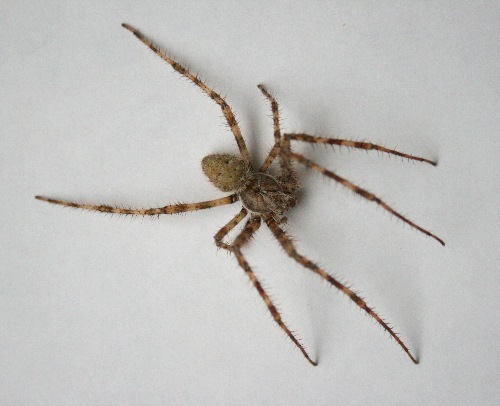 Only going by the coloration of the abdomen of your pictured spider. What do you think? Could be, Chadwick! I get so lost when trying to identify spiders, they all start to look the same. They do seem to have similar markings, though. And thanks! I’m glad you enjoy it! Your spider looks like a huntsman spider to me.